This chapter tries to explain the importance of having a proper financial plan and how it plays a key role in developing a disciplined way of achieving your goals. Every one of us has so many plans for future. We dream of having a luxurious home, fancy car, going for a foreign vacation, want our kids to get great education, have a safe retirement and leave a legacy. However in reality we face a lot of issues like meager salary raise, increasing costs due to inflation, random investments not giving expected return, health issues, credit card bills and need to pay loan EMIs. All these spoil our future plans. Inspite of this, most people do not feel a serious need for financial planning. Unlike people in western countries, most of us don't devote enough time in growing our wealth. It is a mystery as to why we don't mind working so hard to earn an income, but feel lazy to the extent of being careless, towards growing our wealth. Every day we see hundreds of parents being neglected by their children. This situation is bound to get worse in the future, as harsh economic realities strain family ties. It would be wise to accept this reality sooner rather than later. The concept of maintaining financial independence or 'sar uthake jiyo' should appeal to people and encourage them to focus on financial planning and take care of their wealth. Weakening family ties between parents and their children, and the desire for self-dignity should convince people to embrace financial planning in all seriousness. 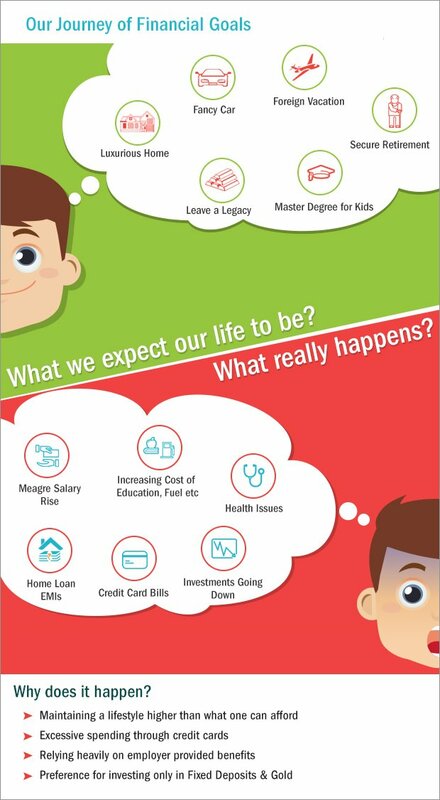 So what is the reason behind so many Indians neglecting the importance of financial planning in their lives? Maybe the Indian economy is so fertile that even the seeds thrown in a random manner have grown into healthy crops. Random investments in real estate, gold and equity have grown in an inflationary era to fetch handsome returns in the past. However, this logic too does not hold true as the bulk of the financial investment of Indians is directed towards fixed income securities, which generate just around the real rate of return, or below it. Surely if an investor has not made money in a steadily rising market, the need for financial planning should be felt much more. Maybe investors are too confident to find the need for advice from a third party, and hence the need for financial planning is not felt. However, when one sees the allocation of financial savings in India being tilted towards fixed income, their claim of expertise seems suspect. In the words of Warren Buffet, "Money is not everything in life. Make sure you have made enough money before you say that". In India, there is an old Gujarati saying; "During bad times, money is as good as a son." The idea behind this proverb is to show the importance of money in the context of our various needs; an emergency, periodic expenses or retirement needs. In order to "make enough money" over a period of time, it is a must to have a proper financial plan early in your life, comprising targeted and regular savings, proper asset allocation and disciplined long term investments. In the words of Warren Buffet, "Money is not everything in life. Make sure you have made enough money before you say that". In India, there is an old Gujarati saying; "During bad times, money is as good as a son." The idea behind this proverb is to show the importance of money in the context of our various needs. From whichever angle one observes the scenario, there seems to be a serious need for financial planning. Let us see how to start building your financial plan. Thus, start building a financial plan by starting to analyse your present situation – How much you own, how much you owe, your monthly expenses, are you covered under insurance etc. After understanding your situation, plan what financial needs you would have in the future based on your goals, aspirations etc. Then decide how much risk you can take when you invest based on your risk appetite. Now decide on an asset allocation strategy and start investing as per the plan. The next important and final step is to keeping track of your investments from time to time and see if you are on track. If you are not, your investments might need a relook. The pains of volatility, no surety of return, potential loss in the principal value of the portfolio (although for a short period of time), etc. are like the fever that one gets when one goes for vaccination. The pain of fever after the vaccination ensures that one remains immune in the future. Similarly, the pain of uncertainty of return creates the gain of better return in the future. A good financial plan will make us resistant to the pains of volatility and will pave the path for long term gains we can earn if we endure the short term pains. To summarize, if people take their kids for vaccination in spite of the pain of the fever that comes with it, there should be no reason to not follow the same principle in financial planning and investments. One must see the wisdom behind accepting short-term pain for long-term gains, before it is too late. Your financial planner can act as your trusted guide in this rewarding but occasionally painful path towards financial freedom.